Pedigree historians have long been suspicious about the exact parentage of the 1880 Epsom Derby winner. The record books will tell you that the winner was Bend Or, a son of Doncaster out of the Thormanby mare Rouge Rose, bred and owned by the 1st Duke of Westminster. However, not long after the 1880 running of the Derby, the owners of the runner-up, Robert the Devil, wrote to the stewards and to Weatherbys, objecting to the result on the grounds that Bend Or was not in fact bred as he was registered. The controversy was even reported by the New York Times back in 1880. The claim was based on the account given by a disgruntled stud groom at the Duke of Westminster’s stud who said that two colts—both chestnut sons of Doncaster—had been inadvertently switched when they arrived at their trainers' yards, and that the colt who raced and won the 1880 Derby as Bend Or was in fact Tadcaster, by Doncaster out of the Newminster mare Clemence. The case was duly considered by the Jockey Club stewards, who issued a verdict declaring that the pedigree of Bend Or was correct and that the Derby result would stand. Following his win in the Derby, Bend Or went on to a highly influential stud career, siring among others the brilliant Ormonde. 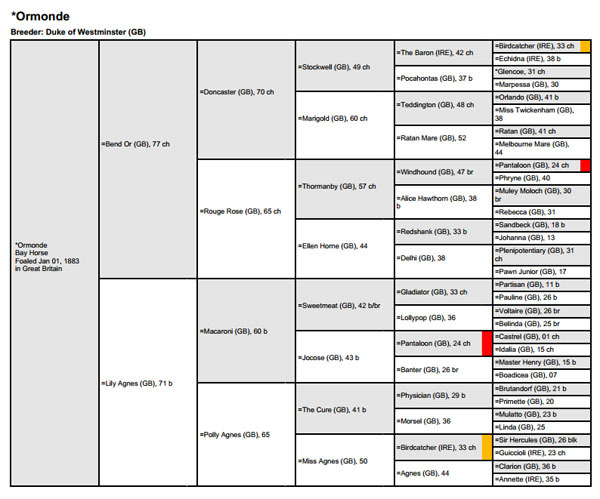 Importantly, Bend Or found favor at stud with mares by Derby and 2,000 Guineas winner Macaroni. Some of the more influential horses bred on this now famous Bend Or/Macaroni nick include the aforementioned Ormonde, leading racehorse and sire Kendal, 2,000 Guineas winner and successful sire Bona Vista, and the Goodwood Cup winner and prolific sire Martagon, among others. Today, Bend Or's name can be found in the pedigrees of many of the most important sires and broodmares in the General Stud Book. A couple of decades after Bend Or’s win in the Derby, C. Bruce Lowe devised and published his Lowe family numbers (later expanded by Goos, Bobinski, and Toru Shirai). Lowe had traced back the pedigrees of the complete list of winners of the oldest English classics—the St. Leger, Epsom Derby, and Epsom Oaks—grouping them by direct lines of tail female descent, from dam to granddam and on back until the family was no longer traceable in the stud book. He then tallied the number of classic winners produced by each family and listed them in declining order. The family descending from Tregonwell's Natural Barb Mare had the most classic winners and was designated Family #1; the family of the Burton Barb Mare had the second most classic winners and was designated Family #2; and so on. The Lowe numbers had little utility in terms of breeding a superior racehorse, but when geneticists came to discover mitochondrial DNA (mtDNA)—the set of DNA that is passed solely and faithfully along the maternal line—the Lowe family numbers became a great reference point for the validity of Thoroughbred pedigrees. While it has been previously reported elsewhere, a team led by Dr. Mim Bower at Cambridge University extracted mitochondrial DNA from the skeleton of Bend Or to discover whether he came from the No. 1 family to which Rouge Rose belonged, or the No. 2 family of Clemence. The team published their findings April 11 in an early view of the peer-reviewed journal Archaeometry. If mtDNA from the skeleton claimed to be that of Bend Or matched the mitochondrial lineage of his dam Rouge Rose (family #1, of which the study had 21 representatives), then it is indeed that of Bend Or. Conversely, if the DNA matched the mitochondrial lineage of Clemence (family #2,18 representatives), the dam of Tadcaster, then the skeleton instead belongs to the lineage presently attributed to Tadcaster. Additionally, they obtained mtDNA from 10 additional historic Thoroughbreds in order to test, with statistical robustness, whether historic Thoroughbreds could be accurately placed within their maternal pedigrees using mtDNA, and compared these data with sequences obtained from 296 living Thoroughbred horses. Well, it turns out that it might be time to change some pedigrees. It now appears that the skeleton of Bend Or belongs to the No. 2 family and, therefore, "Bend Or" is most likely to be the colt by Doncaster out of Clemence. The question is now, in light of this scientific paper, will the likes of Weatherbys and The Jockey Club update their historical records to reflect the corrected pedigree? 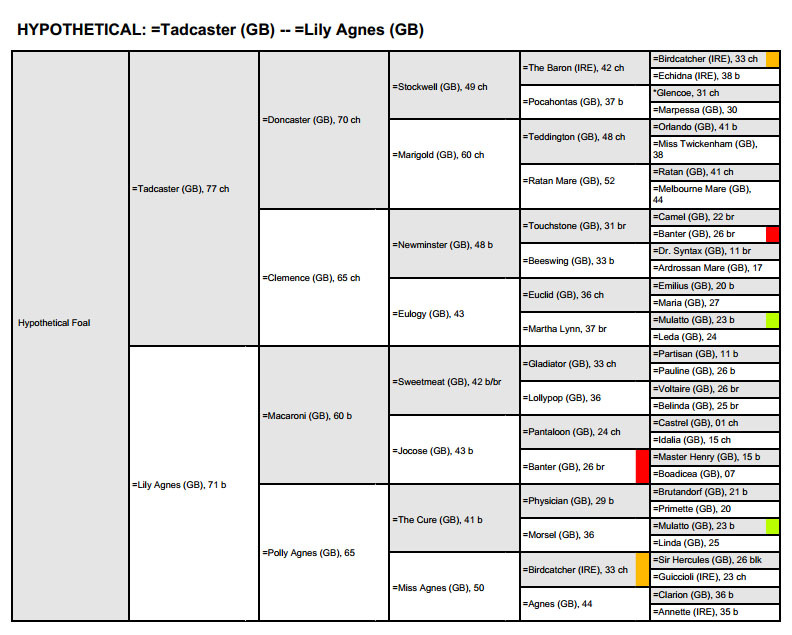 From a practical viewpoint, the change in pedigree makes very little difference; after all, we are talking about a horse racing in the late 1800s and in terms of genetics his impact on performance, if any, is minuscule. However, in terms of understanding how the pedigrees of the great horses of the past were constructed, it is probably quite important that an amendment is made.